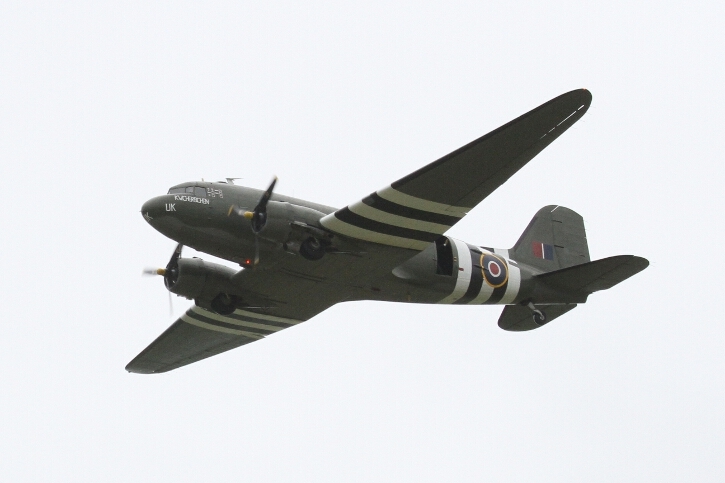 The Royal Air Force Battle of Britain Memorial Flight (RAFBBMF) provided a flypast of the Douglas C-47 Dakota at 3:50pm. The Douglas C-47 Dakota, a military version of the DC-3 airliner, is without doubt one of the most successful aircraft designs in history. It became one of the world’s most famous military transport aircraft and saw widespread use by the Allies during World War Two and subsequently by Air Forces and civilian operators worldwide. 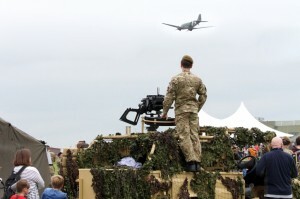 The RAFBBMF is administratively part of the Royal Air Force No 1 Group and operates from RAF Coningsby in Lincolnshire. The aircraft are regularly seen at events commemorating World War II, upon British State occasions, notably the Trooping the Colour celebrating Queen Elizabeth II’s birthday and at air displays throughout the United Kingdom and Europe.